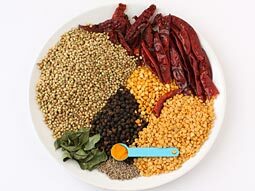 Rasam Powder, an aromatic and spicy mixture of ground spices is added while preparing various types of south Indian style lentil soups (rasam). One advantage of preparing it at home is that you can adjust the amount of spiciness by increase or decrease the amount of black peppercorns and dry red chilies. 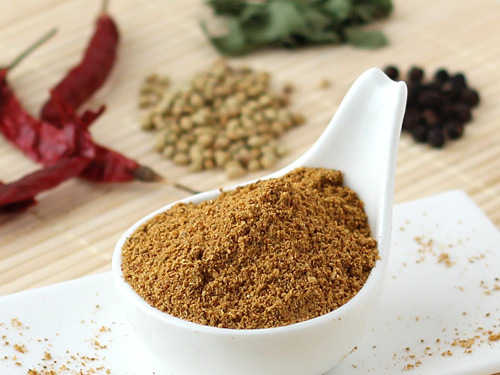 Different types of rasams can be prepared quickly using this homemade rasam podi. Follow our step by step photo recipe to prepare it at home. Place all ingredients except turmeric powder separately in a large plate or on the surface of clean cloth in hot sun light for minimum 2-hours to dry them. This is an optional step but this sun drying process helps to store rasam powder for longer period. Heat a pan (kadai) over low flame. 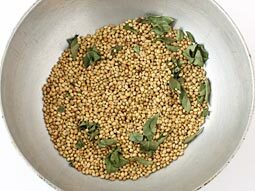 Dry roast coriander seeds and curry leaves until they give aromatic smell. Transfer them to a plate. Dry roast toor dal and chana dal together until they turn light brown. Transfer to the same plate. 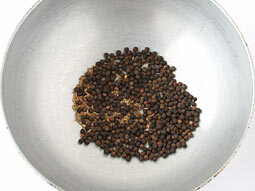 Dry roast black peppercorns and cumin seeds together for 20-30 seconds. Transfer to the same plate. 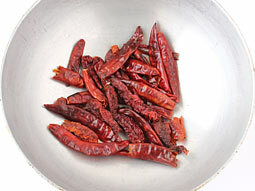 Dry roast both types of dry red chillies for 10-20 seconds and transfer them to the same plate. Let all the ingredients cool to room temperature. 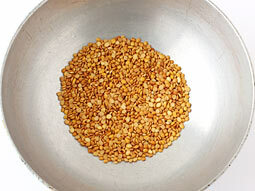 First, add toor dal and chana dal in a grinder jar and grind until smooth powder. Add remaining roasted ingredients and turmeric powder in same grinder jar. Grind until smooth powder texture. Store it in an airtight container to maintain freshness and flavor. Add 2 teaspoons powder while making rasam for 2-persons. 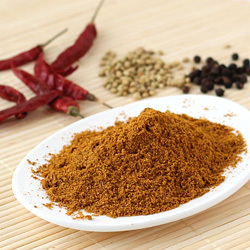 Kashmiri dry red chillies are added for nice color and normal dry red chillies are added for spiciness. Make sure, any ingredient does not burn while dry roasting. It can be stored for minimum 45 days in an airtight container or zip lock bags. 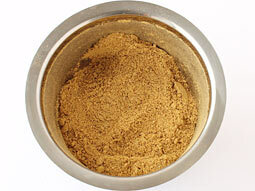 If you are not able to dry the ingredients in sun then you can directly roast them to prepare this powder. 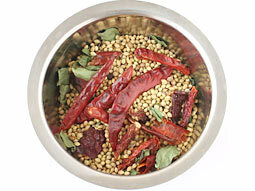 Serving Ideas: It is used for making variety of rasam recipes.